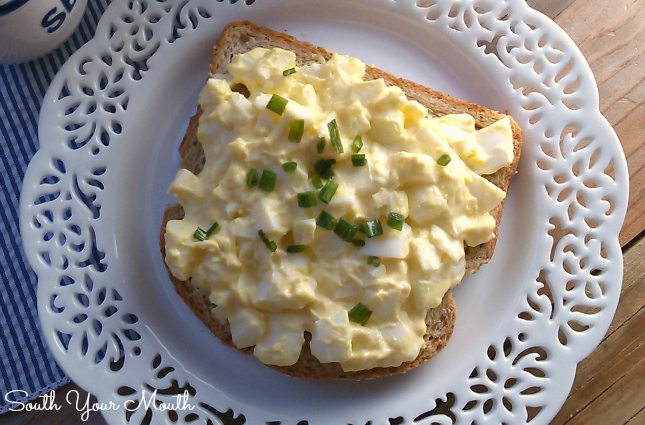 A classic Egg Salad recipe with tips for easy-peel eggs. The secret to this recipe is the three spices you add just a dash of. I set a pot of eggs to boil the other day to make a batch of egg salad and decided to write down how much of this and that I mixed in it so I could share it with you guys. I like to make egg salad for packing lunches and I really like to make it to take on vacation. We might go out to eat for supper now and then when we’re on vacation but for the most part, we eat in. Especially for lunch. When we take off for the beach or the mountains, which we can do easily since we live slap in the middle of South-by-God-Carolina [and the choir sang amen! ], I always make chicken salad, ham salad, pimento cheese, tuna salad and/or egg salad to take with us. They make the best sandwiches and don’t require me to drag out 47 different condiments and 18 packs of lunch meat and cheese when it’s time to eat. All you need is bread. Boom. Done. Here’s a tip for making egg salad (or anything that requires a bunch of boiled eggs): don’t use super fresh eggs. Older eggs (not expired) practically peel themselves. If I know I’m going to be making egg salad or deviled eggs, I always buy an extra dozen a few weeks before I need them so when it’s time to get cooking, peeling the eggs is a breeze! Mine are usually best about two weeks after I buy them. If you have to buy super fresh eggs, add a few teaspoons of baking soda to the water before boiling. Once they're cooked, immediately drain the boiling water then fill the pot with ice. This 'shock' in temperature helps make the eggs easier to peel as well as the baking soda. Psssst.... if you love eggs as much as I do, check out this recipe for Cheesy Baked Eggs I found! Add eggs to a large bowl; set aside. Mix remaining ingredients well then add most of it to boiled eggs (all but about 3 tablespoons). Stir well then add remaining mayo mixture to eggs if desired. Add more salt to taste if desired. I’m telling you not to add all the mayo mixture at first because you can’t work backwards if you get it too soupy. If your eggs were smaller than mine, or your measurements weren't exact, if you weren't holding your mouth right, or the wind wasn't blowing from the northeast at a perfect 74 degrees you might not need as much mayo mixture as I did and I’d hate for you to have a runny batch of egg salad. Ya dig? Garnish with chives or green onions if desired. Oh, this looks soooo good. I, too, have learned that if I buy my eggs about 2 weeks before I need them, they cook up and peel like a dream. (I am the deviled egg girl for Easter in our family.) My family recipe for egg salad calls for Miracle Whip and sweet pickle relish, but I want to try yours. Thanks for sharing. I love Miracle whip in egg salad! My trick for great peeling eggs is to put them in ice water immediately from the pot and let them sit a little. Works for me! Absolutely! I do that too! Me too, then I drain off the water, replace the lid and shake vigorously. They practically peel themselves. That's how I do it too. Works great. 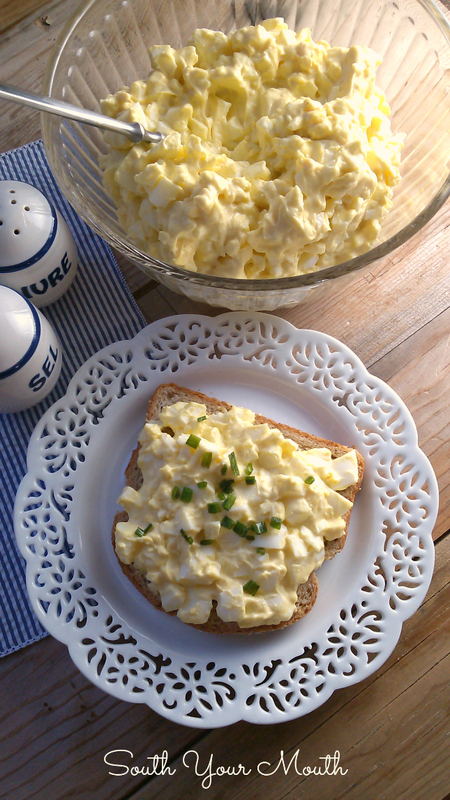 I love egg salad,but never thought of packing it for vacation, a great idea! I always place my eggs directly into ice water and they are still a huge pain to peel ): Any suggestions? I drop my eggs into water when its boiling. I boil for 5 minutes then drop immediately into ice water bath. The shells fall off and the eggs are perfectly done. The best trick I have found (and I have tried A LOT being the family egg maker) is to steam them for 25 minutes, dump in ice water then let cool in the fridge for a couple hours. They peel with no issues and they were fresh bought eggs so they weren't "older". I find that eggs peel really easy if you put a tsp. of baking soda in the water when you boil them. After they cook, pour the water off, shake the eggs up and down in the pan to crack the shells then cover with icy cold water and let them cool. The shells slide right off!! We love egg salad. I put crumbled bacon in mine. Now I'm going to have to make egg salad !! lol! I have had such a hankering for that today and lo and behold there was your email. It is a sign for sure:). Okay, after seeing this recipe and thinking, I just realized my 9, 5, and 4 yr old have not ever had egg salad. This is nuts. 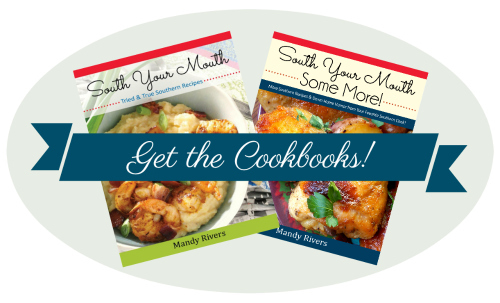 Our roots our Southern~~>Already have my pot of eggs on the stove! Y-U-M!!!!! This recipe is exactly how I remembered eating my egg salad as a little girl. Simple...no crazy additions- just good old fashioned eggs mayo salt and peppa! A good start but I can't help myself....I have to add sweet pickle cubes!! Pinned it!! I grate my eggs with a Pampered Chef cheese grater and use Duke's Sandwich Spread instead of mayo. It is amazing!!!! I put my boiled egg in a wide mouth jar, add a coule tablespoons of water (just guess, no need to measure), screw the lid on and shake vigorously for 10-15 seconds. The shells fall right off. Never fails for me! I just started doing hard boiled eggs in my pressure cooker. 6=Set for 6 minutes, dump into cold or ice water and they peel like a dream!! If it does go to soupy then add a bit of finely shredded mozzarella cheese to the mixture to thicken it up a bit. I used to have a hard time peeling eggs until I learned the trick. Bring your water to a boil before you add the eggs. Lower the eggs into the boiling water gently using a slotted spoon. Lowe the heat to a gentle boil and let them cook for 12 minutes. Drain and add ice cubes and cold water. When ready to peel roll the eggs around on the counter. They will peel very easily. Just add salt to the water.... no problem peeling. Instead of adding mustard I add some finely chopped onion for a little extra zing. Others add a stalk of finely chopped celery. Thank you so much for telling us not to add the whole mixture to the chopped eggs! I evidently was not holding my mouth right and I would have had a soupy mess! 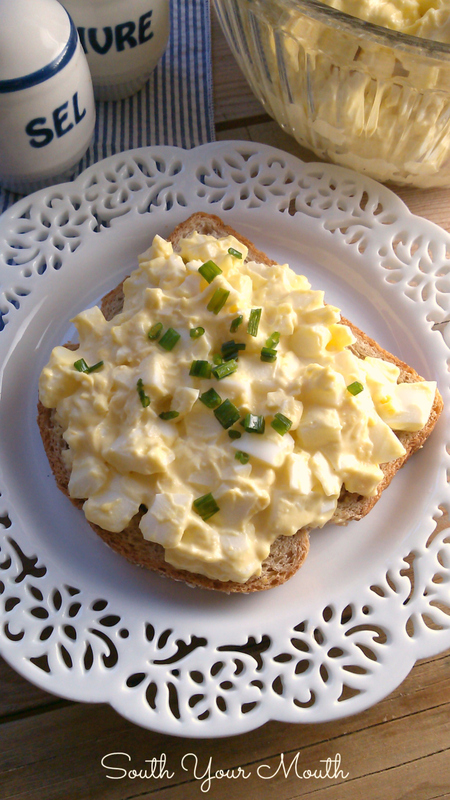 This was a wonderful egg salad...thanks so much for sharing! !